When we bought our 250 year-old ‘fixer upper’ 20 mos ago (and BOY it feels like we’ve been here a WHOLE LOT LONGER), we inherited some items from the former owners. Mostly that mountain of wood in the photo above. Initially we believed this wood would prove useful in the restoration process of the two (formerly) unfinished rooms on our 1st floor (now our Dining Room and Office). 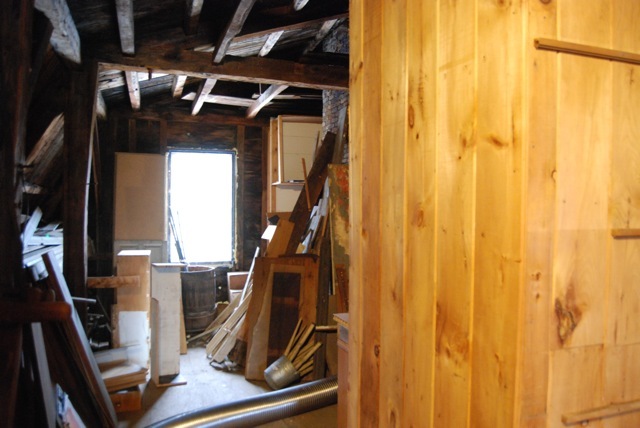 Much of this left-behind wood had come from those rooms originally and we thought it could/should be reinstalled. We thought it would save us $$$. Bottom line? Forget about broom swept. When you buy a house, buy it EMPTY. We bought a house with a lot of old wood. Wood we couldn’t actually reuse b/c it was coated in flaking chipping paint – origin and chemical composition unknown. And with 2 young daughters and countless braincells of our own to consider, not worth the risk. 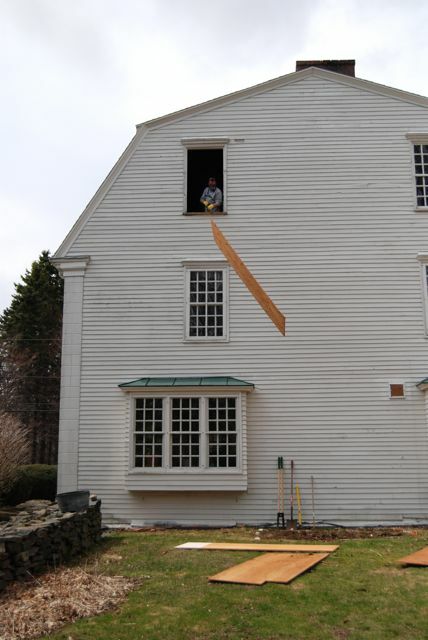 We opted to purchase newly milled woodwork when we restored both rooms. Expensive, but necessary and worth the investment. So what to do with all that left-behind wood? Dumpster city, baby. Last year’s VACATION WEEK! took care of the castoffs stored in the basement, as well as the construction debris we’d accrued in the process of restoration. This year’s VACATION WEEK goal? Get rid of the rest. 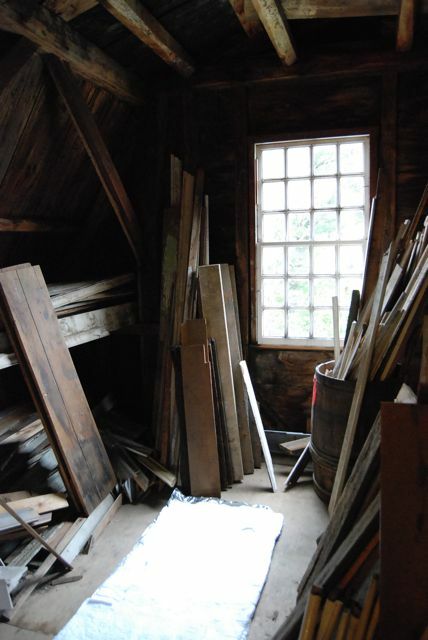 This is what our attic looked like when we moved in. That’s alotta wood! And that’s only one corner. The attic is 1 and a 1/2 stories high and runs the length & breadth of our house. 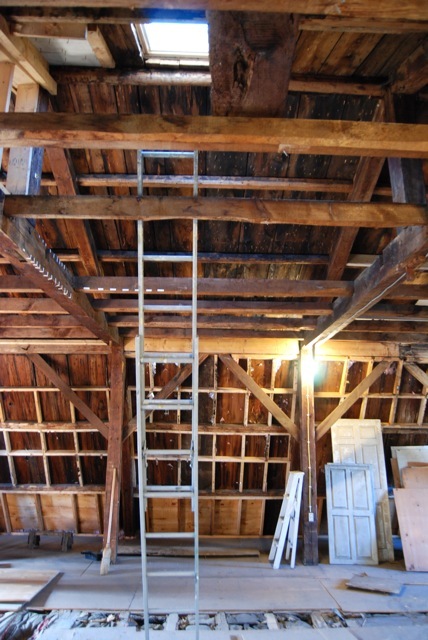 Roughly 1500 square feet of old wood accumulation, plus the rafters. 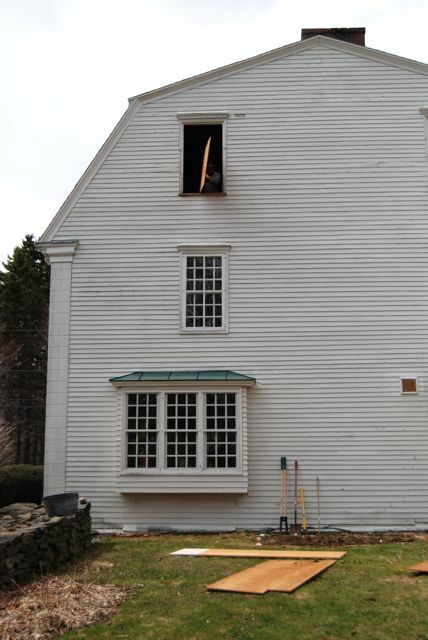 The 250 year old trim from the (formerly unfinished) rooms was just a small portion of what was left. 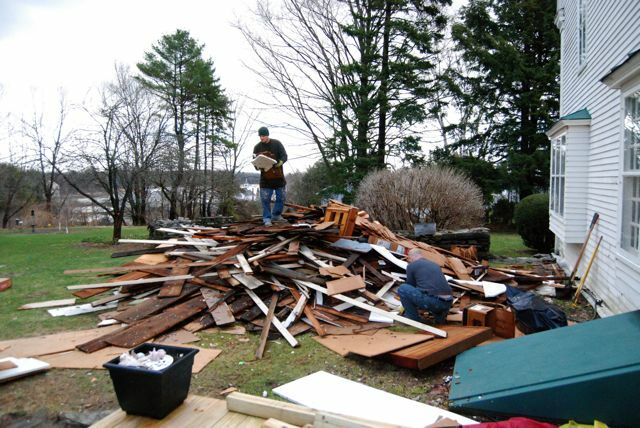 And the former owners tossed FOUR ENTIRE DUMPSTERS before putting the house on the market. That alone is pretty unfathomable. But it gets better. For the past 3 months, whenever he got the chance, my husband was up in the attic taking everything else apart. As in WALLS. You can get a sense of what I’m talking about from the photos below. 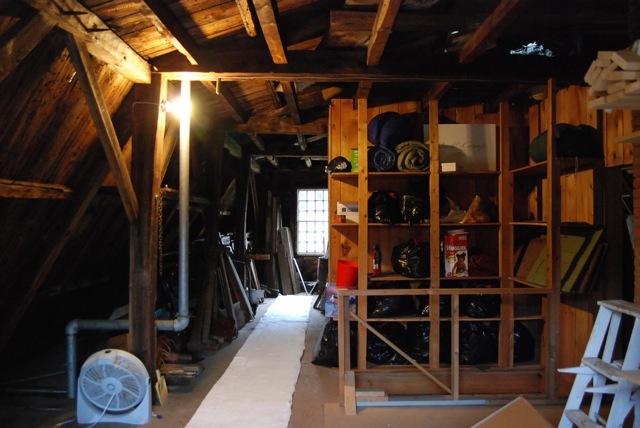 The former owner had used the attic not only as storage, but workshop, and had divided the enormous space into several separate areas. My husband took down ALL OF THIS. The walls, dividers, shelving units, storage, etc. 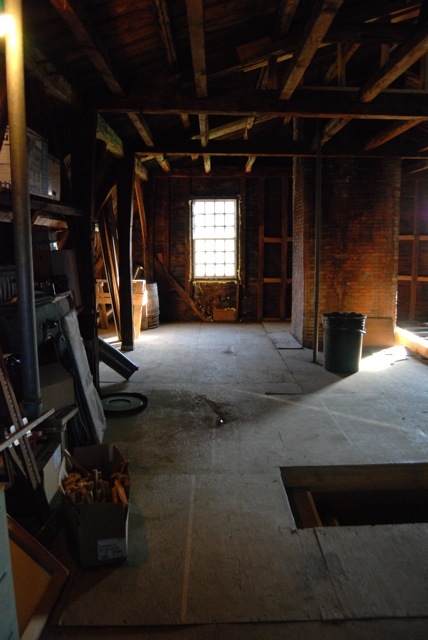 Rendering the attic a single open space. 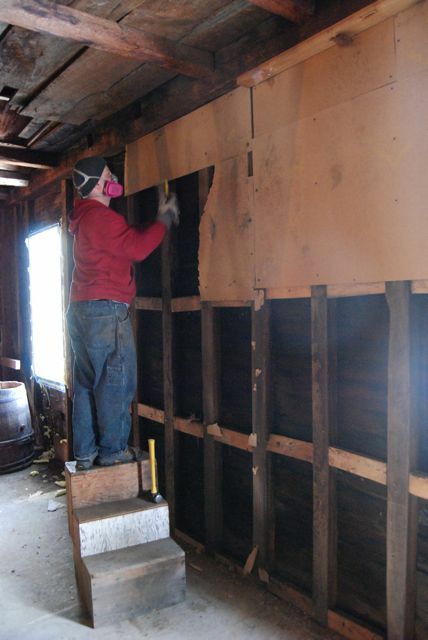 Then he removed all of the particle board and/or drywall covering the exterior walls, in order to extract the insulation behind. 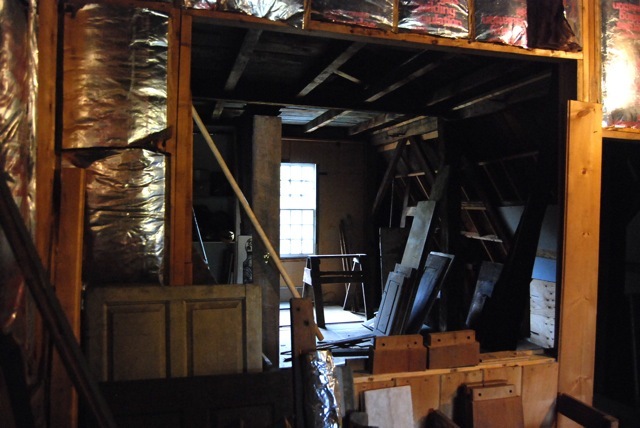 Portions of the attic had been insulated, but the insulation wasn’t uniformly installed. 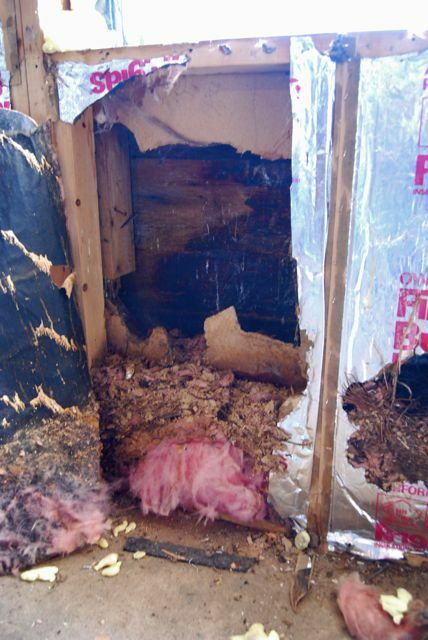 Only a quarter of the outer walls had any insulation at all, and what remained was providing comfy bedding for unwanted visitors, concealing several leaks and encouraging mold growth. Bird’s nest soup, anyone? We bagged up all the nastified insulation. But once all the walls, etc. were taken down, we were actually left with TWICE as much unwanted wood as before. So we began the process of ORGANIZATION. Crazy to think you need to organize crap you’re getting rid of it, but true. We were able to offload some of it via Craigslist. Better a home than a landfill – and it didn’t cost us a penny! 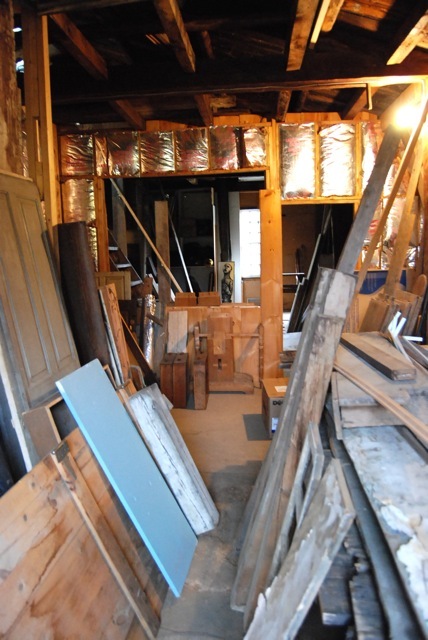 People came and collected all sorts of stuff, from particle board to antique doors to all the old barn board my brother-in-law had removed from the rafters. The rest? The mountain you see before you. The first dumpster was delivered on Friday & by Sunday evening it was FULL. Monday we ordered dumpster #2. 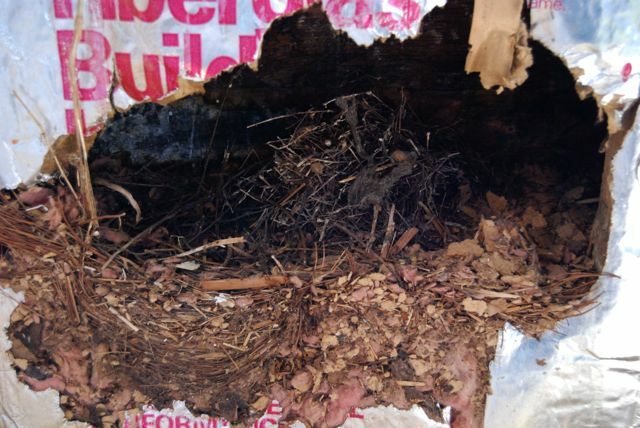 We still had 20+ contractor bags of hantavirus in the attic, plus assorted debris. And we hadn’t even touched the basement! That’s right; more stuff! Although we’d filled a dumpster during last year’s Vacation Week extravaganza, we still had crap leftover. 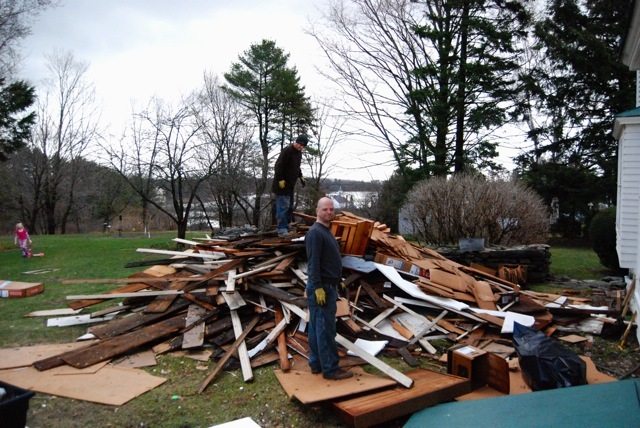 We’d reasoned, “Well.. we’re gonna have to clean out the attic next year anyway, it can wait..” And so it did – until last week. The good news? As of this moment, both our basement and attic are cleaned out COMPLETELY of all unwanted debris. HOOORRRAYYYYYYY!!!! The bad news? 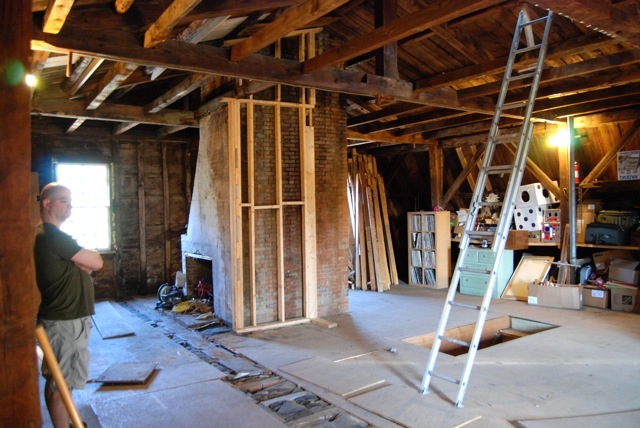 Now that the attic is cleaned out, my husband has begun prying up the plywood in order to level the floor – the first step in “finishing” the space. 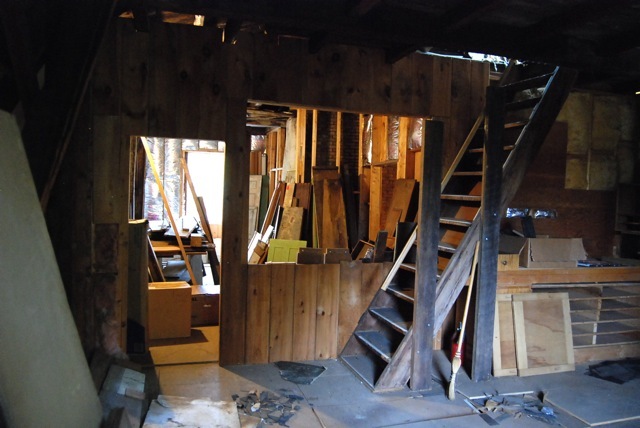 Which (between you and me) is a grand idea, but the prying up process seems to be uncovering (you guessed it) MORE WOOD. I’ll leave you w/ a few parting shots of our cleaned out attic. And if you’ll excuse me, I’ll be in the backyard prepping for a bonfire. Just in case. Next > The Daily Dish has… WON !!!!!!!! That looks like a BIG job! Gargantuan! But you guys have clearly made some amazing progress already (and I can tell it’s defined going to be worth all the time, effort and energy)! Although, a few drinks with tiny umbrellas would have been nice, too! Will likely be worth it with modern insulation in those walls. Better you than me, just the same! Holy moly, mama. That attic, despite all of its hardship-bringing, is uh-MAZING. What’re you gonna do up there?! It’s probably . . . I don’t know . . . EIGHT times the size of Kamran’s apartment? How much would you charge a couple of New York City kids to use it as a studio? Oh, we’d probably need a kitchen and bathroom installed up there, unless you want to feed us and change our diapers. Easy-peasy after all of this, right? WOW. That’s a large workload you got yourselves there. But what a beautiful home! I cannot believe it is 250 years old. My husband completely redid the old hog barn to create a hunting shed, and while it’s a small project in comparison to a home your size, there is a unique satisfaction in knowing your sweat was poured into the creation of the lovely results. I love your colorful kitchen, btw! Wow, you guys are certainly ambitious! The attic alone is the size of a house. 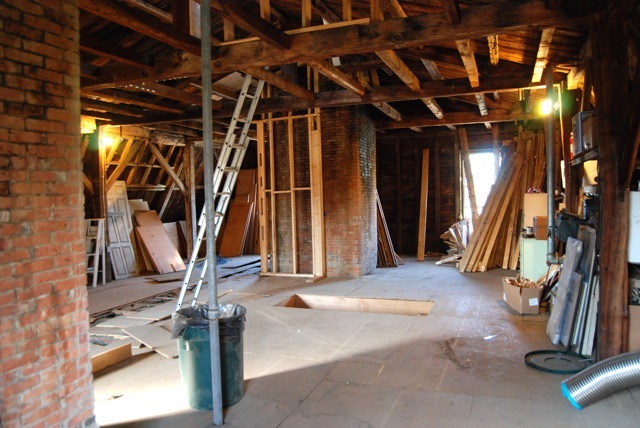 With a couple of dormers or skylights up there, it could be a super studio or apartment. Or maybe a small factory. Hah! Yes, my husband has big plans for the lighting (still top secret) but the space is amazing. Oooh if only we were RICH. The bit where you began finding leaks made me shudder. If sympathy helped I’d send a boatload. Kate, I mean no offense calling it crappe or crap – but I’m sure you know that anyway. You all did your best to help, and it’s a shame we couldn’t use the wood. I still find it unbelievable that you filled 4 dumpsters before putting the house up for sale!! SO GLAD YOU DIDN’T LEAVE ALL THAT!! LOL As for our craigslist pick-ups, it’s fortunate some of the items found good homes — whether the collectors eventually use or sell the material, I’m glad it didn’t get trashed. I can’t stop thinking that you look like The Terminator in that photograph!! 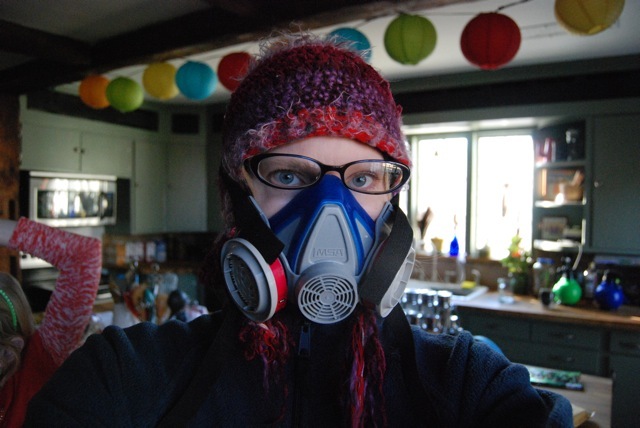 What a high tech respirator! I thought working on the Love Bungalow made me tired but your house takes the cake! I have clearly been lazy in comparison. Hayden, I wouldn’t in a million yrs describe you as lazy. EVER! Especially when the magnificent wonder bag you sent must have taken you WEEKS of hard labor to construct. Which btw is SO APPRECIATED I cannot thank you enough!! 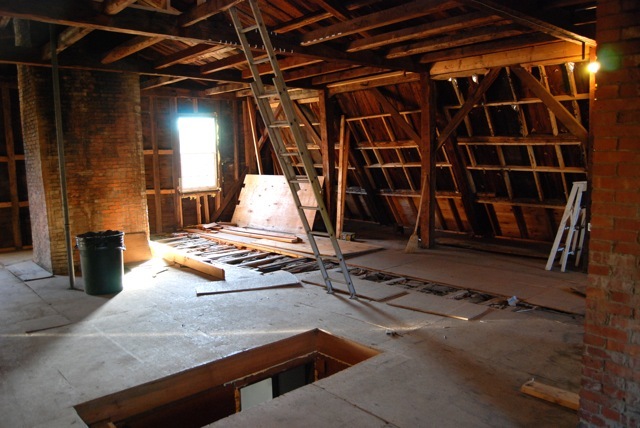 the attic looks great but you know i would have just walled off the entrance and called it a day. you people need a vacation from the DOLE house. Too bad I can’t travel, b/c I’d sure love a vacation right about now. We worked all weekend on the outside (yard) and I am exhausted..
Those honkin white grubs are back w/ a vengeance. So much for Grub-X. This time round I’m going the natural route. Nemotodes. Safe for everyone, except the white grubs. Only downside? We can’t apply them until the soil warms up to ~65 degrees.. which in Maine is about July. Oh well. Just have to switch to a longer term focus. Next year my lawn will be prettier. I hope? WOW! So much to comment on! I can’t believe it has been a whole year already since last year’s clean out. I completely forgot about the mouse in your toilet! HAHA! So funny! The cleaned out attic looks so promising. I bet it will look amazing when you are finished, whenever that will be. And I must say to your husband, “GOD BLESS HIM!” After all of his (and your) hard work, I hope you don’t move for a very long time. 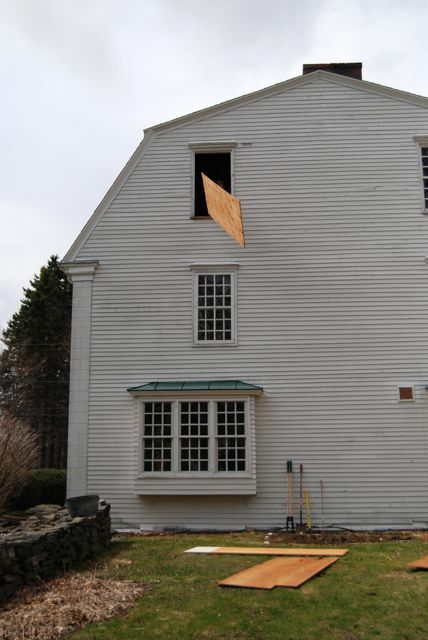 Break your backs restoring the house and then flip it? What a shame that would be even for a nice profit. P.S. After reading this post, I’m going to stop complaining about my replacing my dryer vent. Just doing our part for mankind. These Dole House posts really lend perspective on everyday chores! Tony, I think I am doing the world a service w/ these Dole House posts. On the one hand, perhaps we can inspire others to follow in our wake. On the other, I am ensuring those in the “new construction” industry never go out of business. LOL!! Wow…that’s a lot of wood. I hope you are planning to use them all again instead of burning them. Hah! Nope, haven’t met Stephen King yet — he lives about 3 hrs north of us, in Bangor. As for the wood – it’s outta here!